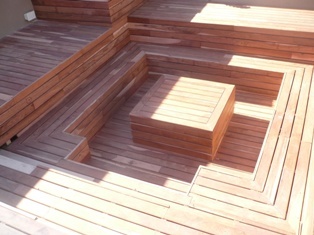 Av wooden floors is one of the main suppliers and installers of wooden decking in Johannesburg, Pretoria and Gauteng. Our wooden decking comes in a range of sizes, colours and finishes giving a dynamic home improvement, adding beauty to your home and creating residential and commercial projects with functionality and style. With our wooden decks, we add style and sophistication to your deck, entertaining platform, pool deck and spa area. There are a number of timber decks we build. These include sun decks, viewing decks, pool wooden decks, braai wooden decks, or on a veranda, or living space, resurface your patio, landscaping, around a jacuzzi and many other decks. A wooden decking helps turn an unused space into a useful outdoor living space, in some cases linking the indoor to the outdoor.Wooden Decks can be an important and useful addition to any home. Now you can replace those worn-out tiles or paving with a nice wooden/timber deck adding value to your home. Av wooden floors have a reputation for high standards of both the product we use for our wooden decking and the professional workmanship. We build our decks to meet the clients’ needs and specifications. Our deck installers are professional and well trained.Besides the supply and installing of wooden decks we also have services that we carry out and they include the design and building of wood structures, balustrade, pergola, cladding, sanding, sealing/varnish,wooden deck refurbishment and maintenance. We know which types of wooden decking is good for the south african weather so we can offer the best advice on what to install. We also offer the best decking prices. We design our clients' wooden decking according to their space and they don't need to sweat about designs because we come up with the best unique deck designs so don't let your wooden decking look ordinary when you can have it looking spectacular.We are the experts wooden decking installers and suppliers in Johannesburg & Pretoria.Our decking prices are competitive in Johannesburg, Pretoria and all over Gauteng. If you need a deck installed or fixed in Johannesburg contact us and that will be the best decision you can make for your deck. It is imperative to always maintain your deck well to protect it from the elements. Exposed wooden decks need to be re-stained every few months especially in high traffic areas. It is of vital importance that this step is taken to extend your decks life since moisture and direct sunlight are the biggest threats to a wooden deck. Using a quality deck sealer is very important as it can extend the life of your wood. Wooden decks should be washed with a high pressure washer and or a recommended deck cleaner. Sweep your deck regularly to reduce dirt accumulating on your wooden deck.When using a deck cleaner make sure to follow the instructions on the deck cleaner. When doing maintenance on the deck one needs to inspect the deck surface for signs of wear, broken decking boards, curling, cracking, loose boards and tear. It is of great importance to replace all broken boards and loose ones to prevent further damage and injuries. Fixing loose decking boards helps to keep your decks intact.Fix and replace all missing screws and fasteners. Always make sure to check for deck structure support damage, it is imperative that all rotten and damaged structure supports are fixing to avoid any futher damage to your deck. Protect your investment by staying vigilant. If you think the job is too big for you to do always get proffesionals to assist. We at av wooden floors offer the best advice and solutions to all wooden decking problems and assist with all maintenance and care.